Highly flexible laminate is a mere .005" thick using 1-ply of fiberblass under the G10/FR4 spec with 1/2oz copper. It will allow you to make the same high quality PCB's you are used to making with our .032" rigid laminate allowing for extremely fine trace pitch with etch times down to a minute (using our "Contact Etch" technique). 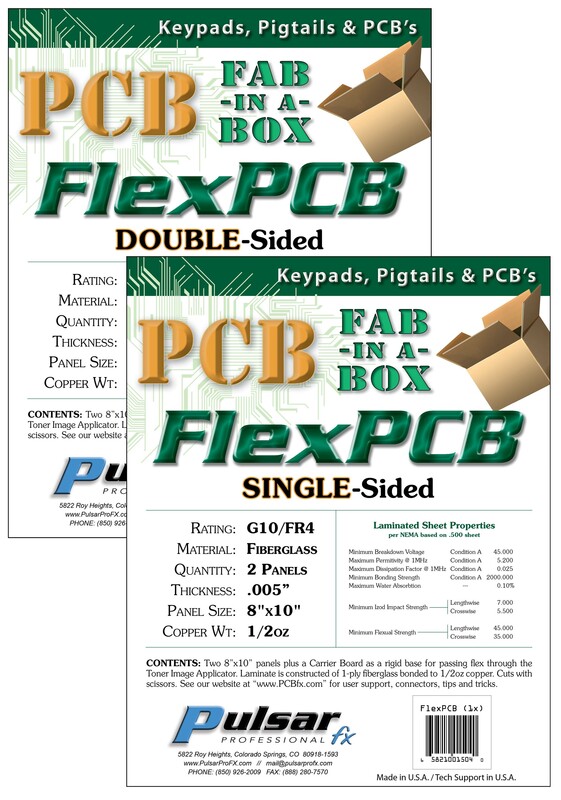 Kit contains two 8" x 10" panels of either Single or Double-sided copper and a .020" fiberglass "Carrier Board", used to transport small pieces of cut laminate through the TIA Applicator preventing wrinkle). You can, of course, use any household iron to transfer your circuit pattern if you prefer but it's highly recommended that you first calibrate the iron. See "Tech Support" button for "How To". Even though this laminate is only .005" (the thickness of an ordinary sheet of printer paper) it has a level of regidity that allows for mounting through-hole or SMT discrete components with ease anywhere along the flex board and of course, the laminate cuts with scissors. Low Prices for our special high quality laminate! POLYIMIDE (pronounced Poly 'IM id or just by the two letters PI) is the type you are most used to seeing with its typical golden brown color. 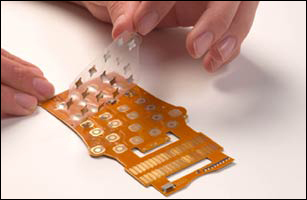 This conventional type of flexible film is generically referred to as Kapton or PyraLux (trade names of Dupont). 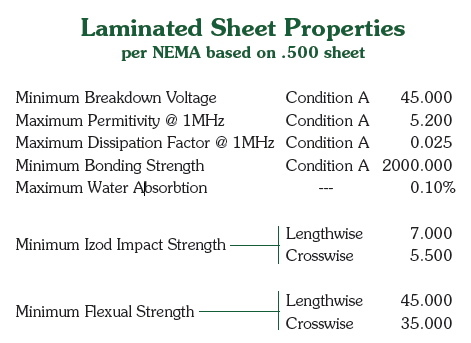 FIBERGLASS based flex is the alternative to the very expensive polyimide or "PI" laminate. Our flex is built on just 1-ply fiberglass to enable it to be just as flexible as PI films. Fiberglass based flex is rarely seen in commercially made products for some unknown reason. Disadvantages and Drawbacks? Well, yes... they both have a few! The #1 drawback of using polyimide-based flex in a design you are wanting to do is flat-out availability! The #2 drawback is COST! Polyimide film has a ton of parameters to contend with... there is the Type of polyimide base to select to which there are 4, Thickness of the film (8), Adhesive (3) and finally, Weight of the copper foil (6). That's a lot to have to deal with. Sure, you could contact Dupont or Insulectro (distributor) to obtain samples but you have to go through a lot to setup an account, etc, etc, but what then? There is no 're-supply' on samples and you can quickly over-stay your welcome! And yes, we could have offered one specific type of polyimide type board for "general" use as we have done with our rigid board, but we still couldn't get around the second most important drawback of using this type of flex board... COST! Polyimide film is about 6 times more expensive over the alternative of going with 1-ply fiberglass. Is it just as good? Well, in light of just a tad bit of compromise, we feel that's answered with a definite yes! ...mounting descrete components! When components are to be mounted on PI film you normally need to add what's called a "stiffener" in the area around the components to prevent copper foil cracking or delaminating. It's a second layer of a prescribed pad thickness laminated under the film. All in all, it's just a much harder product to consider working with for anything short of commercial, high-end mass production. And since we cater directly to everyone OTHER than that, it just doesn't make sense to offer expensive Polyimide as the flex board material of choice. Ok, so we've put the 'kabash' on polyimide pretty hard here. So what's the disadvantage of using OUR 1-ply fiberglass? All things being equal, there really is only one problem using 1-ply fiberglass. It tends to "snap" (ie. crack!) when folded hard over and CREASED flat! But don't dispair, there is a very simple fix to this problem inherent to fiberblass as being brittle. If your design needs to turn a hard 90º or flip over itself 180º (as in this simple keyboard example on the right) 1-ply fiberglass will crack in half. Surprise! Notice in the example on the right, the artwork is setup to have a hard 180º creased fold-over bend in the middle. Well, if that is done and the board cracks, the only thing holding the two "pieces" together are the 4 circuit traces and that isn't very stable. Here's the fix! Reference the modified image on the left. By merely placing a small retangular area of blank copper over the fold line to be creased flat we can now retain full integrityof the finished board.The traces going across this crease line lend their assistance too. Here is the full-size artwork with graphics and "spacer" overlays. 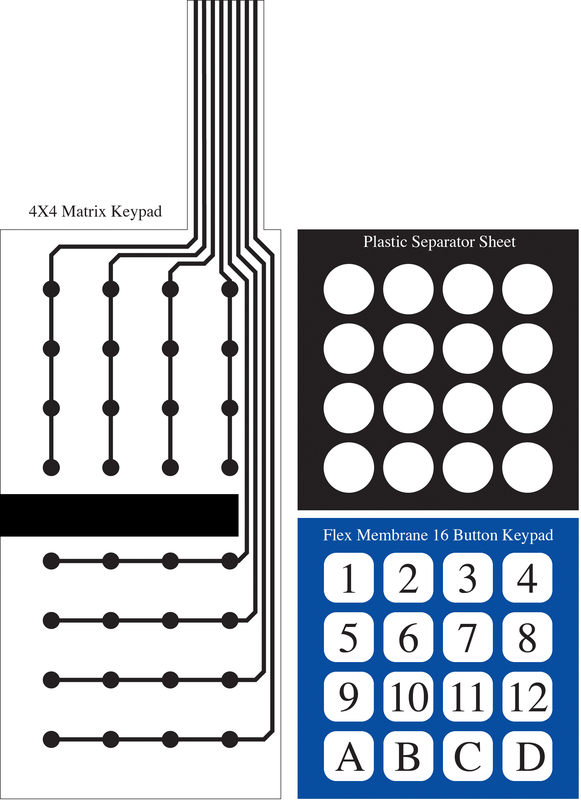 Flex membrane keypads can be made using this layout, folding it in half with a simple "spacer" made out of a piece of "Overhead Transparency" acetate which gives very fast response times, or you can add tactile feedback with "domes" placed over each key described a little farther down the page. The FlexPCB is going to be a little naked unless we can make some connections very easily. We'll discuss two items... Connectors and Domes for keypads. The tail end of your flex board's connection is generally done one of two ways. One way is to leave the tail end alone and just push it into a PCB mounted connector as shown below in the "Termination Types". 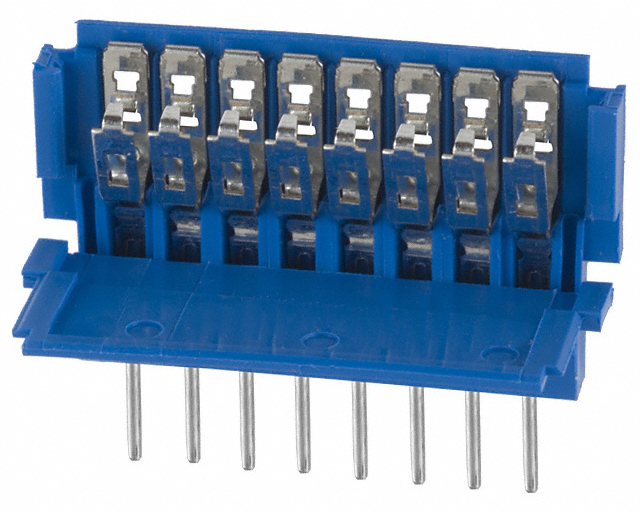 DigiKey and Mouser have a wide variety of board mount connectors. The two main manufacturers of all PCB connectors for flex-type laminates are FCI and TE Connectivity. 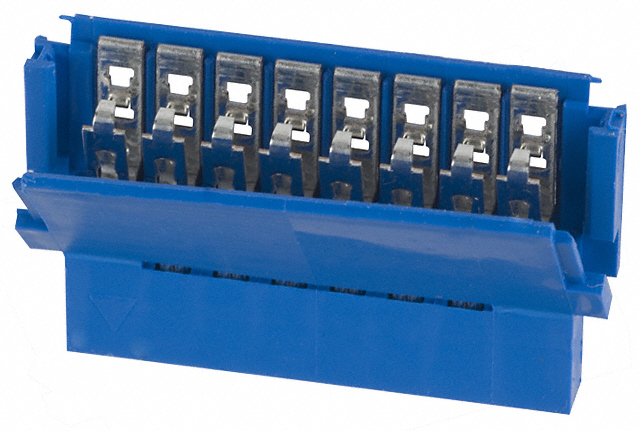 The other method is to add a male or female "crimp" style connector. These have piercing "crimps" that pierce through the flex laminate to make a very good connection to the copper trace. These two photos show how the crimp type connectors look before use. This particular style is called "Clincher" made by FCI (a major connetor mfg). This kind of connector mated to the end of a flex pigtail is called a "Free Hanging" connector, as opposed to a "Board Mount" connector (described in section above) where the bare pigtail is pushed into the soldered connector on the PCB. There is a lot to choose from. These two blue units above happen to be 8 conductor connectors from DigiKey, part number 609-2164-ND (male) and 609-2182-ND (female). One of the leaders of "keypad domes" is a company by the name of SnapTron.com. One of their pre-made designs has a hole in the middle of the dome to allow an LED to light up through the button! This gives the designer some very very cool visual effects possible. There's no secret to making flex keyboards. It's a very simple process allowing you to let your creativity flow for very uniquely shaped keypads, never having to accept boring pre-made keypads ever again. All you're basically doing is spray gluing a few layers together and you have a flush, surface enclosure mounted keypad with the tail tucked under the keypad and into the enclosure. Also to reduce the number of "X" & "Y" contact points, we generally want to use one of the common keyboard encoder chips, like the 74C922 to easily handle up to 16 keys with a BCD output for minimal microprocessor pin usage. You can do the typical "fold over" as we've shown above or make the keyboard a single layered sandwich to include "domes" to give the user a positive tactile "click" when pressed. With just a little "Googling around" you'll quickly learn the "ins 'n outs" of making your own personally shaped keypad with custom full color fronts using any color laser printer or copier. Rock on custom keyboard fans and show us what you've made! Make something really cool looking and shoot us some pics. Every subject is worth $20 in free supplies and we even pay shipping. NEW ITEM! 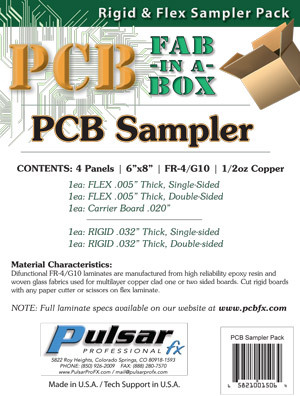 "PCB SAMPLER Pack"